Lounging with a Latte: Just enjoying life! I enjoy the period between Christmas and New year, where everyone seems to be in chill out mode and there is a lot of the spur of the moment social catchups. It has been a month since Dad passed away, and life is starting to get back to some sort of normality. There will always be the sadness and my eyes well up with tears when I look at photos of him, but his life was good and we are to be thankful. Mum is doing really well, she is surrounded by lovely people at Resthaven who are keeping her company and involving her in the activities that go on, and she is receiving quite a few visitors too. Such a blessing. Our newest Cafe in town is within one of our wonderful gift/home shops called Lavilla. It's a great place to catch up for coffee and light lunches with friends, which I did last week. I ad a delicious Turkey baguette and iced coffee. On boxing day when Daniel and Telesha announced their engagment, we went around to their place at night for pizzas and drinks with both families. It was a fun night. One of Telesha's nieces kept coming over to my hubby Paul to get her head rubbed...she loved it. Paul and I headed down to McLaren Vale for a couple of days and stayed with good friends. One of the nights we got Barnacle Bills and took it down to the beach, we haven't been to the beach for so long. The photo is of 2 of our friends daughters, Lauren and Hannah. Back in my teenage years I loved reading the Sue Barton series of books by Helen Dore Boylston, which followed the life of 3 friends who started nursing together. There were 7 books in the series. I managed to find the 'Visiting Nurse' book at an opp shop recently and enjoyed reading it. I have the 'Superintendent Nurse' and am now on the lookout for the rest to make up the series. 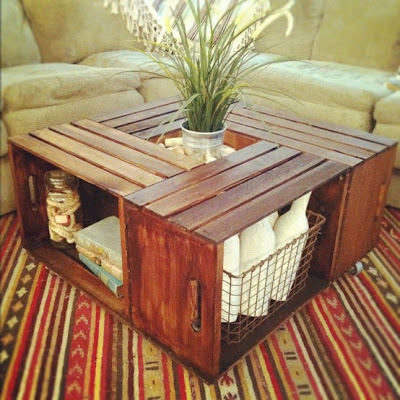 My favourite find on Pinterst this week was this coffee table made out of wooden crates. How clever! Might keep an eye out for wooden crates now too!! We are experiencing very hot weather here in Australia, with temps in the 40°C's. Nice and cool inside though which is where I plan to stay!! beautiful memories are always stored in you heart Annette and remembered with a smile. I hope that the hot temperatures will begin to ease for you all soon. There must be a lot of fires with all that heat. I am sorry to read about your Dad. I am sorry to hear of your Dad's passing. Wow! 40 degrees-it never gets that hot here. Quite a contrast to our -8 today! I am so sorry about your father's passing. It's been nearly 5 years now since my dad died. I remember how stressful that was. This year will tough. It's all the "firsts." but it gets better. Just knowing your mom is well taken care of must be a huge comfort. Wishing a peaceful New Year! It's nice just to take a breathe after Christmas and New Year, isn't it? I'm glad your Mum is liking Resthaven. We have Resthaven community services in our town and my Mum has been having them clean her unit fortnightly for some time now. When she hurt her hand it was no trouble to organise a carer to shower and dress her daily as she was already in the system. Very nice staff too. Mum has gone into our aged care facility for respite while her hand heals. She went in Friday and so far seems to be enjoying it. Sort of like a holiday for her, I suppose. Her only complaints so far is that the meals are too big and the 3 ladies she sits with for meals are deaf and don/t strike up conversation! Things could be worse! At this stage it's for a month but should she like it, it may become more permanent. Hi I'm in Sydney, it has been hot so far we missed most of the heat our super hot days start tomorrow not looking forward to that, all the best and stay cool. So sorry to hear of the passing of your dad. May you be comforted during this time. Can you believe we are experiencing temps in the 70's here in the southern US? Getting some rain but otherwise it feels like spring! Love the table. Pintrest is the best!